This loop hike through Memorial County Park has a nice variety of scenery. 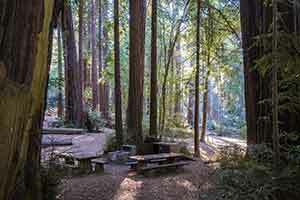 The hike begins south of Pescadero Road in a large campground set in an old-growth redwood grove; the campground is very popular in summertime but empty in winter. 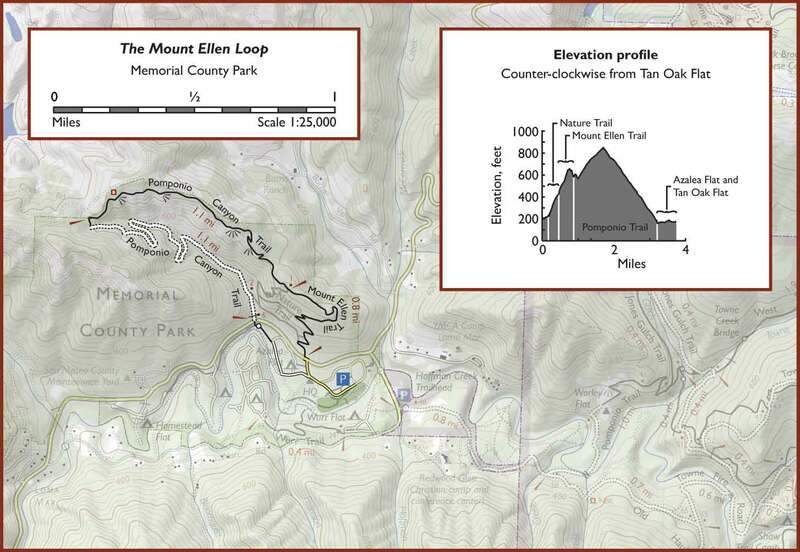 You’ll then cross to the north of the road, where a few short backcountry trail loops climb a small hill that’s been rather overenthusiastically named “Mount Ellen” . 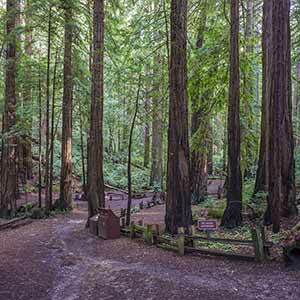 In an area densely blanketed with redwoods, this loop is a little unusual because only about a quarter it is in redwood forest. 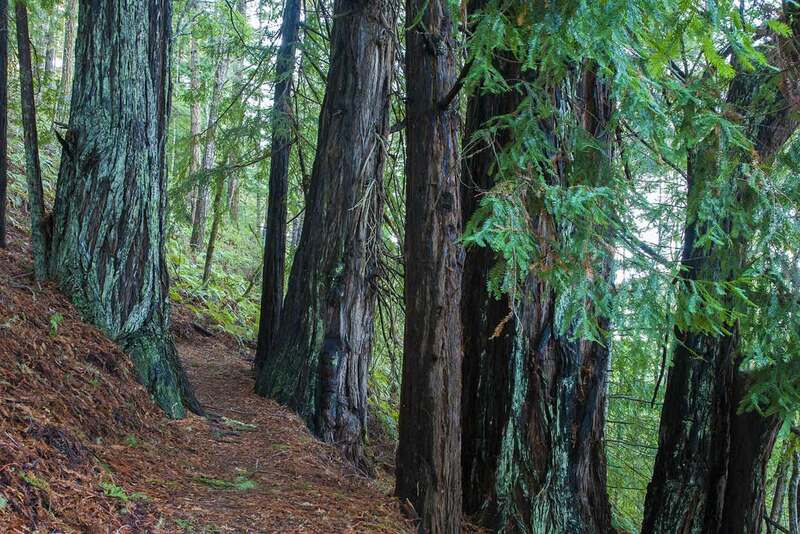 The rest of the hike passes through some especially attractive and unusually lush forest on the Pomponio Trail, some sunny chaparral with nice views, and some of the area’s typical tanoak/Douglas-Fir woodland on the slopes of Mount Ellen. Near the end of the loop there’s a fairly impressive (though mostly logged) redwood-filled ravine. The varied scenery makes this one of the more enjoyable hikes in the area, and I always find a stroll through the lush green hills to be a refreshing getaway. 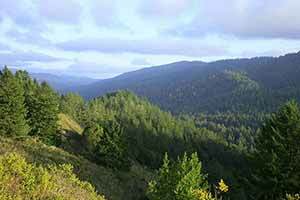 Aside from its low redwood content, this hike is actually very typical of the Pescadero Creek area. North of Pescadero Road the park feels quiet and remote, with no traffic noise. The trails are well-designed and maintained and summertime temperatures are refreshingly cool. And is quite pleasant even though there aren’t any standout destinations or knockout views. 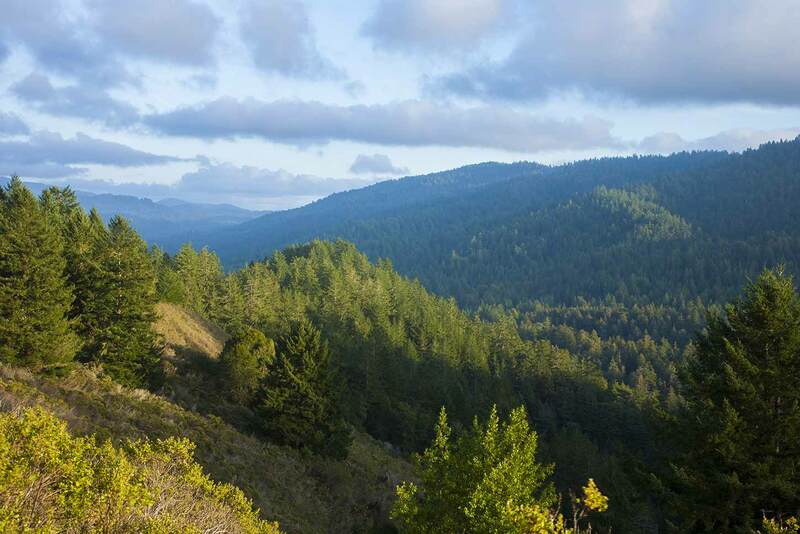 For an all-day outing, try pairing this hike with the Coyote Ridge loop, which spans Portola and Pescadero parks. 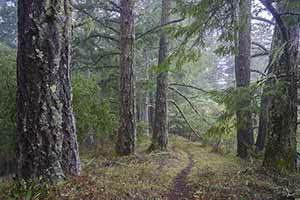 Together the two hikes provide about 11 miles of hiking with similar yet complementary scenery. 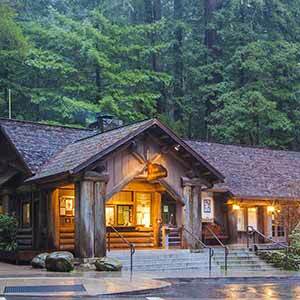 A scenic half-hour drive separates the two hikes. The easiest way to get to the park is the coastal route: Highway One to Pescadero, then a 15-minute drive on Pescadero Road to the Memorial Park entrance. 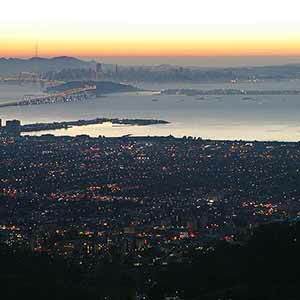 The next easiest route is Woodside and La Honda Road from Palo Alto, which is twisty but wide, well-maintained, and fairly easy to drive. Finally, there’s Alpine Road, which is considerably twistier, narrower, and bumpier, but also offers more scenery. From the South Bay all three routes seem to take the same amount of time, about an hour and fifteen minutes. 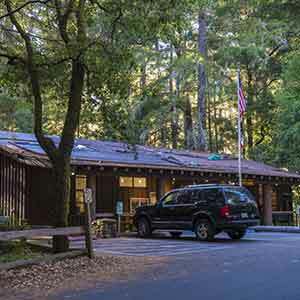 For a nice drive consider taking Alpine Road to the park and Highway One back. Park at the Hoffman Creek trailhead, on Wurr Road. If you’re feeling extravagant, you can pay $6 to park inside Memorial Park at Tan Oak Flat, which will shorten the hike by a few tenths of a mile and give you a nice shady parking spot. 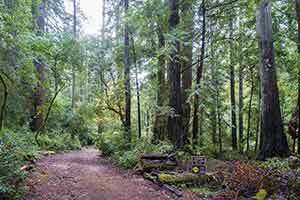 In summer, you can detour through some scenic old-growth redwoods by taking the trail that starts across from the Hoffman Creek parking lot. The short trail peters out just before reaching a paved spur road; turn left onto the road to get to the Wurr Flat campground loop road, then turn right. Follow the paved road, staying to the right until you reach the Wurr Trail. 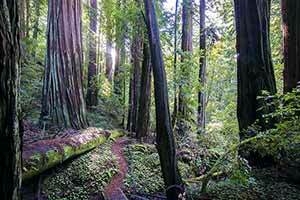 Take this trail, which winds through some attractive redwoods before descending slightly to end at the Sequoia Trail. Turn right, cross Pescadero Creek, and follow a dirt road that climbs slightly up to Tan Oak Flat. Turn left onto the paved loop road and continue straight, past the park store, to reach the park entrance. 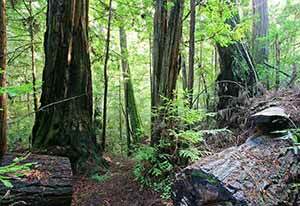 Although the redwoods in Tan Oak Flat seem to be old growth, there are very few really big trees. It’s likely that this is not due to logging but is the natural state of the area. 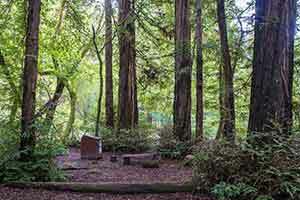 Memorial Park sits at the northern edge of a large, continuous redwood forest that blankets the Santa Cruz Mountains. Here at the edge of the forest, growing conditions here might not be as ideal as they are in Big Basin. 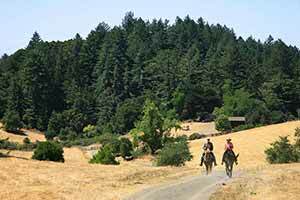 In winter, start the hike by following Wurr Road back toward Pescadero Road. Just after crossing Pescadero Creek, take the trail to your left, then immediately turn right to climb a steep set of stairs. Follow the short path to Tan Oak Flat and turn right onto the paved loop road. Follow the road and turn right at the next intersection. Pass the park store and continue to the park entrance. Continue past the entrance kiosk to reach Pescadero Road. The Nature Trail/Mount Ellen Trail trailhead is across the road. The Nature Trail switchbacks insistently up Mount Ellen. It’s a half-mile of climbing at a slightly steep 15% grade, giving you a good workout. 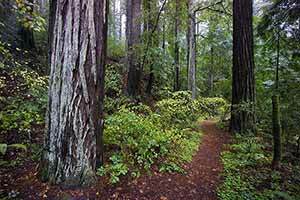 The trail quickly leaves the redwoods behind and enters a mixed-species forest, although you’ll pass a few small pockets of redwoods as you climb. Stay to the right at the next two intersections. There’s no view to speak of from the top of tiny Mount Ellen, just a lot of trees. The trail descends slightly and comes to an intersection with the Pomponio Trail. Continue straight. After climbing through several more switchbacks, the trail breaks out of the woods and into chaparral. This mile-long stretch of the trail was rather overgrown on a recent winter visit. 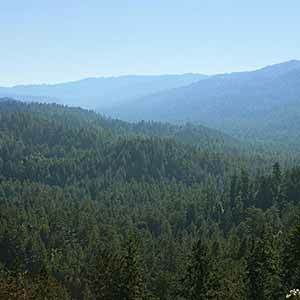 Looking back, you can see the little pointed hill that is Mount Ellen; behind it, the conifer-clad Butano Ridge stretches off into the distance. Soon after the trail begins a gentle descent, then, after passing a bench, becomes a dirt road. 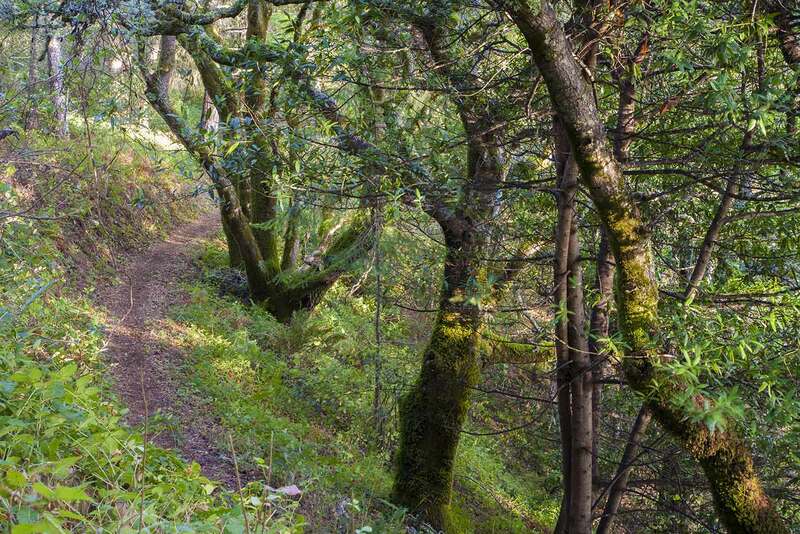 Having switched from a south-facing hillside to a north-facing one, the trail leaves the chaparral behind and abruptly enters an exceptionally lush forest with a dense layer of ferns carpeting the steep hillside. The top of the trail is especially scenic and passes an interesting variety of trees. 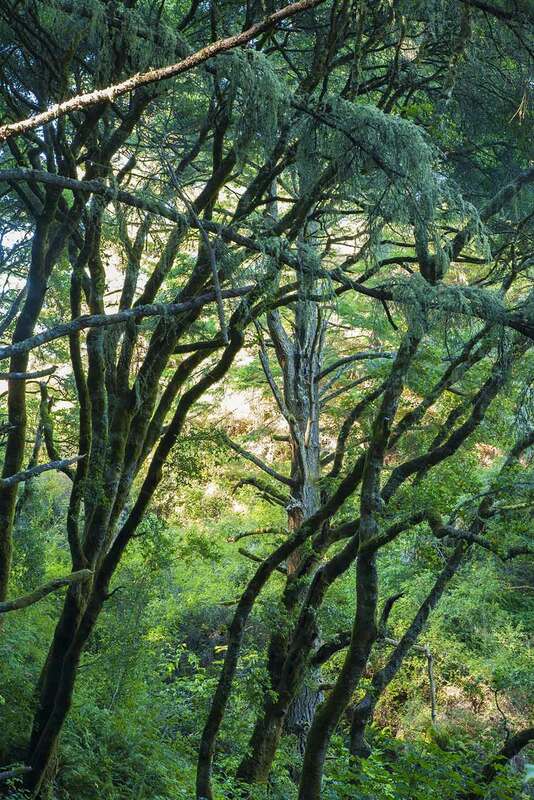 The trail descends into a dark, redwood-filled ravine. Although most of this area has been heavily logged, a small area near the intersection with the Nature Trail appears to be unlogged, and still has some pretty impressive redwoods. Cross Pescadero Road and look for a small sign that says "trail". 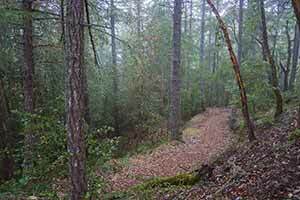 Take the trail a short distance to Azalea Flat. When the trail ends, turn right onto the campground road and return to Tan Oak Flat. Here are a few more pictures of the Mount Ellen loop.